Just as an ordinary city becomes a throbbing metropolis with the right attitude and intention of the public and political leadership, organizations too thrive with the right balance of skills and abilities. Today, organizations across the globe are facing a severe challenge in improving profits while operating amidst a no-nonsense, cut-throat business environment. This calls for in-depth manpower planning and optimization by balancing the right skills and capabilities. That is why we work closely with manpower consultants to enhance productivity by rethinking about our people in a new way. This includes workload analysis, redefining internal roles and responsibilities to help us optimize manpower to meet present and future contingencies. A typical manpower project involves redesigning jobs and reallocation of authority. We make sure that the managers are adequately trained and have developed their abilities to perform well in their new role. It is the scrutinizing, reviewing and forecasting of the number of heads that might be required by an organization to achieve its objectives. It’s also a plan that is formulated to ensure that worker skills are utilized to the benefit of the organization, and that individual employee aims and career objectives are also addressed. The manpower planning process is affected by the organization’s strategic management decisions and environment uncertainties. There must be a system in place so that demand forecasts and supply assessments can be monitored on a continuous basis – checking and making adjustments and changes in the programmes to put the supply and demand of manpower resources on track. Manpower demand is the total human resource demand in an organization. Once the factors affecting the demand are identified, forecasting methods can then be designed and implemented. Manpower budgets and projections are usually based on estimates of the amount of work to be done. Conversion ratios that translate workload data into manpower demand can be used for short term demand forecast though the results are just a rough approximation. This is done with mathematical and statistical models that are based on selected key variables that affect manpower requirements of a company. Some models contain both internal and external variables – like domestic and foreign competition, the economic climate, laws and technology when it comes to external variables, and budget constraints, production levels and services, and organization structure when it’s a matter of internal variables. This is a quantitative approach – the linear regression analysis may be used to estimate the manpower necessary in the future based on sales, output or services rendered. Like, if a school is expanding from primary to secondary then more teachers will be required. 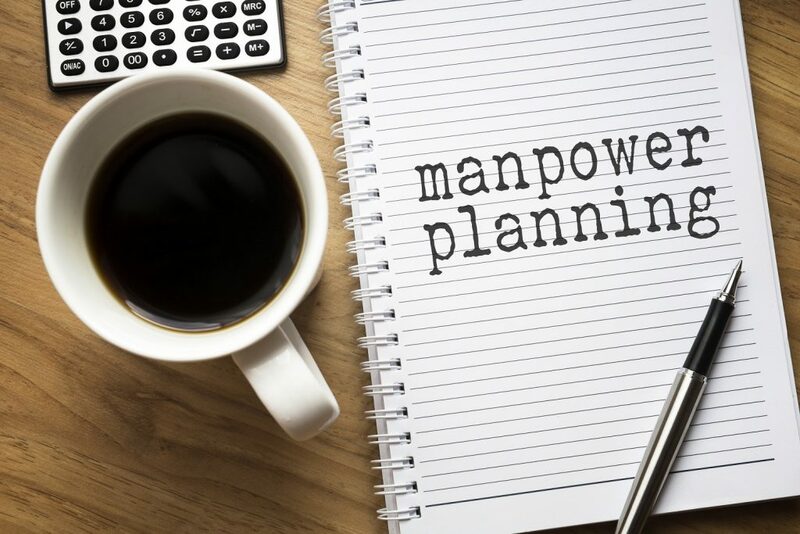 Manpower planning is not only concerned with providing adequate number of heads to fill positions within the organization, but it also includes placing the right person in the right position. Balancing manpower supply and demand is largely the ability of the organization to plan, to time, and the use of various personnel-related programmes to achieve the desired result. Statistical techniques concentrate on the quantitative aspect of manpower planning. Statistical trend analysis uses a metrics called operational index in assessing both supply and demand. This method assumes that past trends and ratios are reliable enough to predict future trends. When it comes to new businesses, some organizations (with less than 5 years of stored data) use a method called Ratio Analysis to develop annual manpower plans. Here, information gathered by observing the competition becomes the base for identifying determinants known as causal factors, which are then used to predict future staffing needs. Statistical techniques are also used to create a realistic hiring and training budget. To summaries, the process of forecasting personnel requirements of the organization and developing necessary strategies to meet those demands are what comprises the role of manpower optimization in modern day organizations.